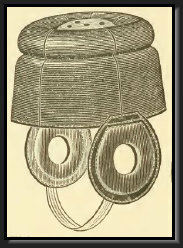 The improved head harness refers to a style developed around 1898-1900 that typically consisting of a hard shell crown made of sole leather with padded ear flaps attached to the sides of the crown. 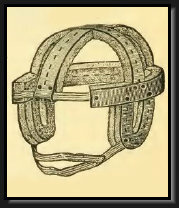 The earliest variations of the improved head harness, such as the Spalding No. 50 (1899), included a leather strap across the forehead and metal rivets connecting the leather straps to the shell. By 1900 these features were removed. 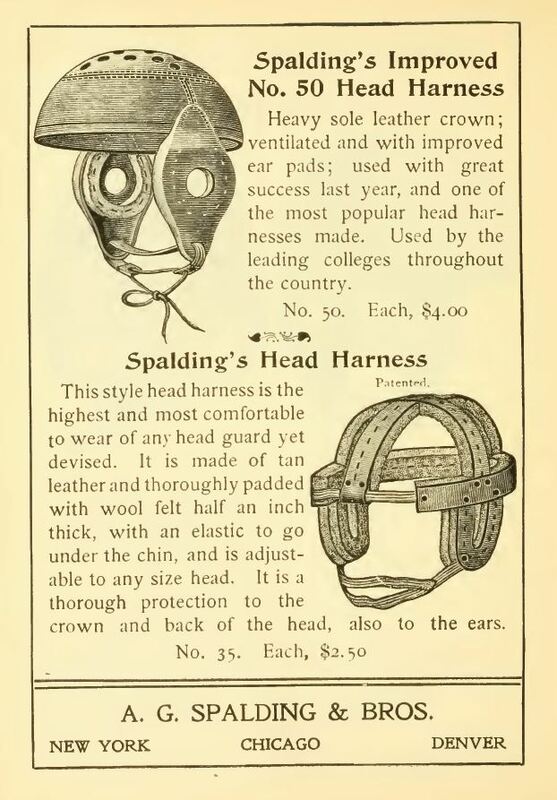 The improved head harness was manufactured primarily by Spalding between 1899 and 1903, but other examples from unnamed manufacturers also exist. 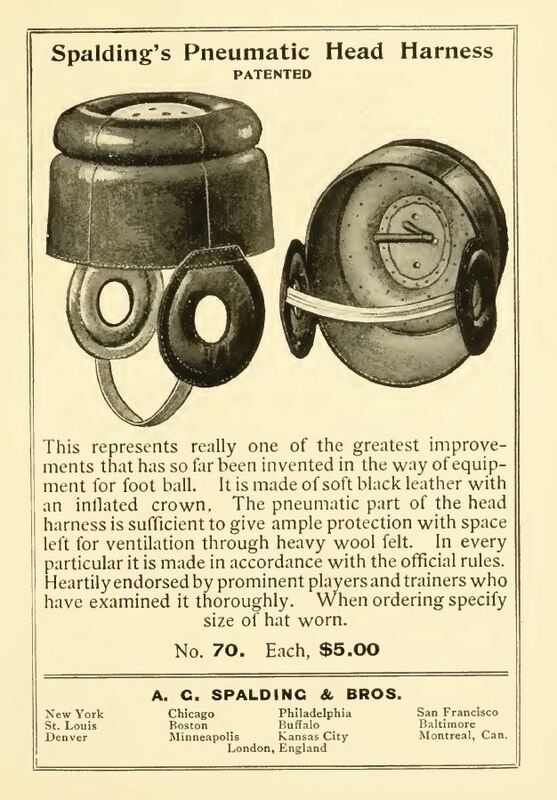 Manufacturers discontinued the production of improved head harnesses in 1903 when the Intercollegiate Football Rules Committee banned the use of sole leather in football head harnesses. No. 50. Heavy sole leather crown, filled with air holes and lined with lamb's wool padding. Ear protectors heavily padded with felt. Used by the leading colleges and is the best and most practical head harness yet made. Each, $4.00. With just a 3 year production run (1901-1903) the No. 30 Chicago Head Harness ranks as our #3 rarest head harness style. A hybrid between a 4-spoke and an improved head harness, the No. 30 was exclusively manufactured by Spalding. The No. 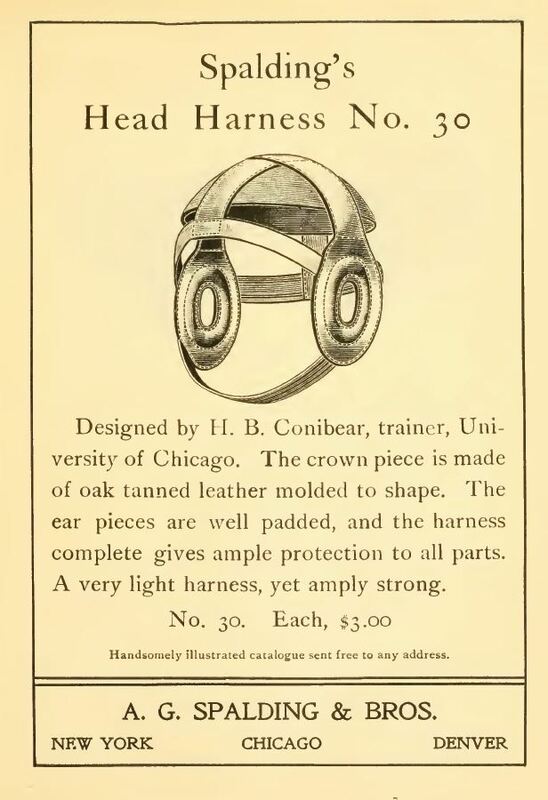 30 was given the name the "Chicago Head Harness" because it was developed by the head trainer at the University of Chicago. A very light and airy head harness, the No. 30 provided relatively minimal padding for the crown of the head. Designed by H.B. Conibear, trainer, University of Chicago. The crown piece is made of oak tanned leather molded to shape. The ear pieces are well padded, and the harness complete gives ample protection to all parts. A very light harness, yet amply strong. 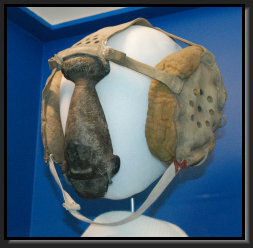 The second rarest head harness in existence owes its ranking to its utter failure when used on the football field. The Spalding No. 70 Pneumatic Head Harness utilized a rubber bladder in the crown of the harness to act as a shock absorber. The harness proved to be hot and unreliable as the bladder was known to rupture after a few blows. As a result, the No. 70 was only produced for two years (1903-1904) and the vast majority of those produced were likely discarded after failure. This represents really one of the greatest improvements that has so far been invented in the way of equipment for foot ball. It is made of soft black leather with an inflated crown. The pneumatic part of the head harness is sufficient to give ample protection with space left for ventilation through heavy wool felt. In every particular it is made in accordance with the official rules. Heartily endorsed by prominent players and trainers who have examined it thoroughly. When ordering specify size of hat worn. This style head harness is the lightest and most comfortable to wear of any head guard yet devised. It is made of tan leather and thoroughly padded with wool felt a half-inch thick, with an elastic to go under the chin and is adjustable to any size head. It is a thorough protection to the crown and back of the head, also to the ears. Each, $2.25. The #1 rarest football head harness style is without question the Spalding No. 25 Head Harness/Ear Protector. 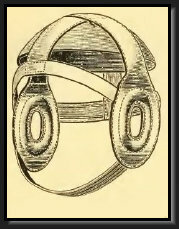 Designed to be worn by players with damaged ears, this style harness also came as the No. 15, which only included one ear protector pad. The No. 25 afforded practically no protection to the crown of the head. The sole surviving known example of a No. 25 is on display at the Pro Football Hall of Fame in Canton, Ohio. Especially intended for protection to ears. The harness is made of special tanned leather, the padding for ears of soft material and open in centre to allow same to entirely surround ear and rest against the head. 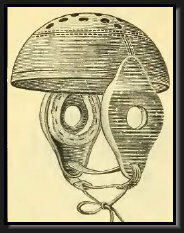 See article "Curtiss' Pneumatic Head Harness" for further reading. See article "Holy Grail Discovery" for further reading. See "Artifact of the Month - July 2015" for further reading. See "Artifact of the Month - August 2015" for further reading. See "Artifact of the Month - September 2015" for further reading. See "Artifact of the Month - October 2015" for further reading.